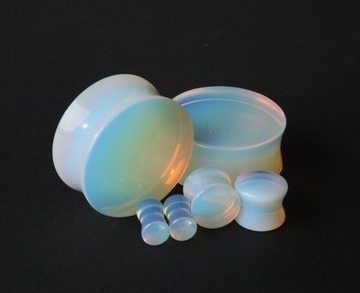 These plugs are made from Opalite which is a treated glass that is a beautiful creamy whitish blue color! Opalite is a delicate clear or milky iridescent stone, which when placed on the Crown Chakra in meditation is said to enhance psychic abilities and induce visions. In healing Opalite is believed to stabilize mood swings and purify the blood and kidneys.